In July 1918, during the Second Battle of the Marne, the German command decided to cross the Marne to reach Paris, which at the time was already threatened by the formidable shelling of the long-range gun nicknamed 'Big Bertha'. The allied strategy was to allow the Germans to advance before attacking their flanks thus forcing them to retreat. Starting from Villers-Cotterêts, a huge French counter-offensive was launched by the 10th Army under General Mangin at 4:30 am on 18 July. 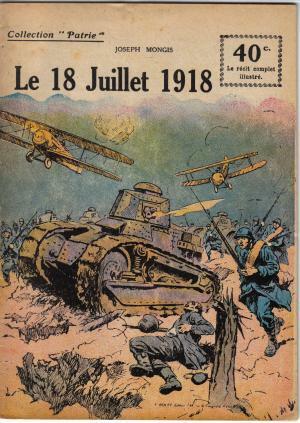 Cover of a booklet showing the close collaboration of tanks and planes Joseph Mongis, July 18, 1918, collection Patrie, 1919. 2000 artillery pieces, 350 tanks and 500 aircraft provided the support for an advance of thousands of men. Simultaneously, General Degoutte launched an offensive further south with his 6th army and 150 tanks. This was the first big victory for the Renault FT 17 tanks. July 18th marked a decisive step in the conflict. It demonstrated the success of a huge deployment of armoured vehicles supported by air cover. Henceforth, it would no longer be possible to envisage battles without tank participation. Book : Alain Gougaud, L'Aube de la gloire - les autos mitrailleuses et les chars français pendant la grande guerre, Histoire et technique, Musée des blindés, 1987.